BUSINESS & LIFE CHANGES COACH. that’s where I draw my inspiration, energy and drive. If your life path or professional career brought you in a situation where you have encountered difficulties caused by cultural change, you will probably relate to my story. When I was 18 and about to choose which university to go to, I remember telling my parents: “I want to study journalism and anthropology, become a journalist and I want to travel to write stories about people and populations around the world!”. I already believed back then that everyone had an interesting story to tell. 5 years later I found myself with a bachelor in International Politics and Economics, living in Shanghai, and exporting underwear for an Italian brand… I was not a journalist, but I was back in Asia, a place I had lived in as a teenager. Once again I was on the road, travelling and meeting new people on daily basis, while managing ever growing teams of staff across different countries and cultures. This kickstarted my career in the Fashion & Apparels industry, which lasted nearly 15 years. So there I was… from six figures salary top management position to unemployed… with no idea about what to do next. I knew one thing: with my 40s getting closer, I had to take this opportunity to make a life change and reconnect with my inner self, values, and dreams. And I also felt the need to make my life and working experience, which had been so rich and fulfilling, available to other people. But… how? I had experienced being coached myself and witnessed the positive impact coaching can have on people. I saw in coaching a possible way to combine my professional and personal life experience to help others benefit from the lessons learned along the way. To support all individuals who are moving abroad, to live relocation as an ‘opportunity’ rather than a loss. To share my strategies and equip them with the necessary skills to make the most out of every new experience. Similarly, I can use this knowledge to help companies and organisations thrive through cultural changes: to achieve excellence in performance by making cultural intelligence part of the company culture. Through coaching and mentoring, I aim to contribute towards making all companies a better environment to work for members of all generations, be it generation Z, millennials or older. I live every coaching session as a special and unique experience, as a journey with my client in which I do not lead, but I support and motivate. I think of me as a “train coach”, transporting my clients from one station to their desired destination. I’m their transport vehicle, their facilitator, helping them through the train ride that is their life journey. In every journey I take with a client, I also reach a new place and find myself enriched. This is my new travelling. I will be hearing a lot of stories of different people and have the honour to be part of them! In coaching I have found a way to help others fulfil their dreams while fulfilling mine! My multicultural journey starts with being born from Italian parents in the Ivory Coast and spending my childhood in Venezuela, Colombia, Algeria and Russia. In 1989, my family moved to China, shortly after Tiananmen events, where I spent my teenager years living between the Gobi Desert and Beijing. Later, I won a scholarship to attend the United World College and I got my IB Diploma from UWC S.E.A in Singapore in 1997. After graduating from the University of Trieste in International Politics and Economics in 2002, a year as Social Educator for Intercultural Integration Projects and an Internship at the International Cooperation Department of the Ministry of Foreign Affairs, I could no longer resist the Asian calling and felt I should return, so I succeeded to get a scholarship from SDA Bocconi and ISPI Institute from Milan to pursue a Master Degree on Business in China. That’s when I truly immersed myself in cross cultural management and communication. In 2005, I moved to Shanghai to work for an Italian intimates brand and for the next 13 years I remained in the Fashion and Apparel industry, focusing on sourcing and production start-ups. I lived between India and China and travelled regularly to Turkey and Russia. During this years I managed teams of all sizes across different countries and I developed further more my cross cultural management and communication skills. In 2015 I moved with my family to Prague to adventure in the digital world, consulting for two local fashion e-commerce businesses in building private labels from ground zero. The present finds me embracing change with a new challenge: sharing my multicultural work and life experience as Business & Life Coach, mostly focusing on cultural change and integration for international businesses or expats. 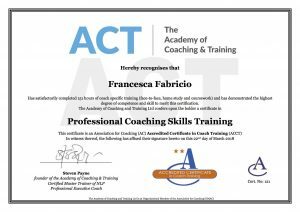 I have obtained my coaching certification (ACCT – Accredited Certificate in Coaching & Training) and I am a member of the Association for Coaching. Last but not least, I am a licensee of mapps®, coaching & training method by the Italian consulting firm Trivioquadrivio. If you feel the need of support to make the most out of your cultural change experience, your next step is to book a FREE DISCOVERY CALL, during which we will discuss your particular situation and explore how my coaching services may be a fit for your needs.